Hyundai is no stranger to building vehicles that get Top Safety Pick+honors from the Insurance Institute for Highway Safety, but the company is getting two of the awards at once thanks to the latest results from the 2016 Tucson and Sonata. Both models feature a front crash prevention system that’s rated highly by the safety agency. The biggest advancement in this round comes for the new Tucson. In the small-overlap front crash, it now earns the IIHS‘ best score of Good, versus Poor – the lowest – for the previous generation. In the latest test, the crossover shows at most six inches of intrusion into the passenger compartment, compared to 16 inches last time. The airbags work to protect the head, and the sensors indicate a low risk of injury. The Tucson has Good ratings in all the other safety evaluations, too. The 2015 Sonata already did quite well when checked last year, but Hyundai apparently wasn’t happy with the sedan’s Acceptable result in the small-overlap front crash. According to the IIHS, the automaker adjusted the driver’s seatbelt and the front suspension in hopes of a better score. 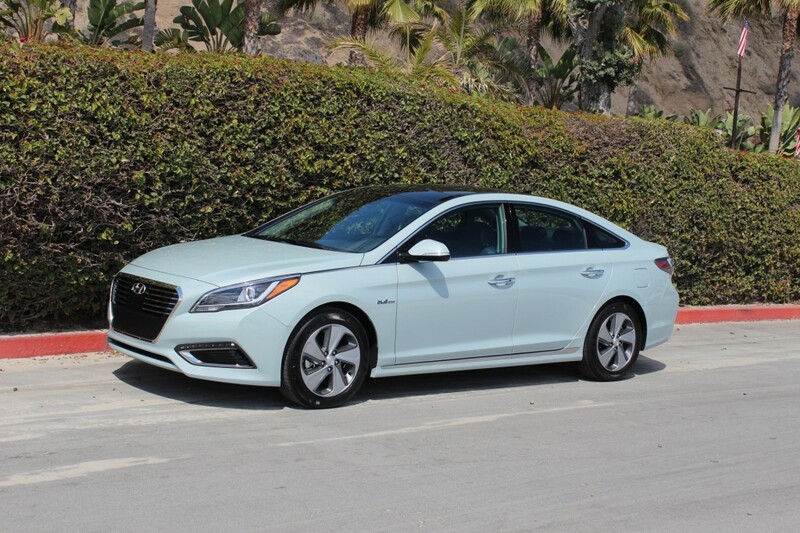 However, even with the tweaks, the 2016 Sonata kept the same result. It scored Good in the other safety categories. The company isn’t giving up on acing things, though. “Modifications are planned to take Sonata to ‘Good’ in the small overlap test,” Hyundai spokesperson Jim Trainor said to Autoblog. The IIHS gave the crash prevention tech in both models its top Superior grade. The systems’ automatic braking was able to avoid accidents from 12 and 25 miles per hour. The forward collision warning added the last bit needed to give them the maximum six points from the institute. ARLINGTON, Va. — A redesign for 2016 has taken the Hyundai Tucson from a poor to good rating in the Insurance Institute for Highway Safety’s small overlap front crash test. With an available front crash prevention system that earns a superior rating, the small SUV qualifies for the TOP SAFETY PICK+ award. The 2016 Hyundai Sonata also earns a superior front crash prevention rating and a TOP SAFETY PICK+. In the Tucson’s small overlap test, the driver’s space was maintained well, with maximum intrusion of 6 inches at the parking brake pedal, but no more than 3 inches at other locations. The dummy’s movement was well-controlled, and the front and side curtain airbags worked well together to protect the head. Measures taken from the dummy indicate a low risk of any significant injuries in a crash of this severity. In contrast, when the previous generation of the Tucson was tested, the intrusion was severe, reaching a maximum of 16 inches at the parking brake pedal. The steering column moved in and to the right, causing the dummy’s head to slide off the left side of the front airbag. The head hit the instrumental panel, and the side curtain airbag didn’t deploy. Like its predecessor, the redesigned Tucson earns good ratings in the Institute’s other crashworthiness tests — moderate overlap front, side, roof strength and head restraints. The Sonata, a midsize car, was redesigned for the 2015 model year. For 2016, Hyundai made changes to the driver’s safety belt and the front suspension in hopes of improving the small overlap rating from acceptable to good. Those changes weren’t enough, and the rating remains acceptable. It earns good ratings in the other crashworthiness tests. Both the 2016 Sonata and the 2016 Tucson have an available front crash prevention system that includes automatic braking. The vehicles avoided collisions in IIHS track tests at 12 mph and 25 mph. The optional package also includes forward collision warning that meets criteria set by the National Highway Traffic Safety Administration. That gives the vehicles the maximum six points for a superior front crash prevention rating. To qualify for the 2015 TOP SAFETY PICK award, vehicles must earn good ratings in the moderate overlap front, side, roof strength and head restraint tests, plus a good or acceptable rating in the small overlap test. For TOP SAFETY PICK+, vehicles also need an available front crash system with an advanced or superior rating. The Institute plans to raise the bar in 2016, requiring a good small overlap rating for either award. Vehicles with an acceptable rating, such as the Sonata, will need further improvements to qualify for 2016 honors.